Saturday, November 25, 10:00 a.m. to 9:30 p.m. 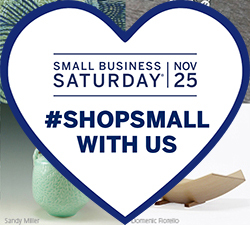 This weekend, we want to celebrate Small Business Saturday with you! It’s a special holiday created so communities can show love for small businesses and organizations like ours. And it wouldn’t be a celebration without customers like you joining us. Let us pamper you with refreshments, complimentary gift wrapping, and the chance to win a gift basket filled with artisan goodies (and of course, some of the best local shopping in the city with items by more than 100 Northeast Ohio artists, all under one roof!). Heights Arts members ( as well as members of BAYarts and Valley Art Center) also save 10% on all purchases. As an additional bonus, the Cedar-Lee District, in partnership with the Heights Library and CSU Small Business Development Center is offering special Shop Small perks to community shoppers. Any customer who spends a minimum of $25 on November 25 with Cedar-Lee businesses, can bring their receipt to the Main Library in exchange for an entry form for a chance to win door prizes. From the purchase of goods, gas & groceries, to services, dinner or a night at the movies, customers will have until noon on Monday, November 27 to submit their entry form. Make a day of it and patronize the Heights businesses you love, for the community you call home, and for the money that stays in the neighborhood when we all Shop Small.